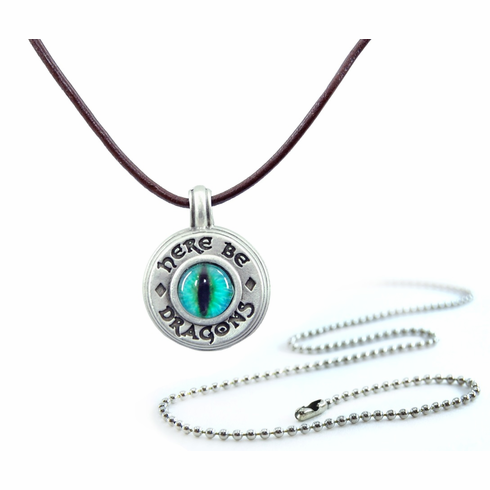 Featuring the text "Here Be Dragons" with a Dragon-Eye insert in the center, this compass pendant necklace is sure to attract everyone's attention. And the functioning compass on the back will always help you find your way out of the dragon's lair. Each pendant is cast in solid pewter, and features both an adjustable leather cord (30” max) necklace and a traditional stainless steel ball chain (30” max) necklace. Use with either of the two necklaces provided, or use this great compass pendant on any necklace of your choice. The natural silver color of the solid pewter jewelry goes with almost anything, and won’t tarnish over time.